Sri Lanka’s Collective of Nationalist Organizations has organized an agitation and a march tomorrow to protest attempts by India’s Tamil Nadu politicians to divide the country. The collective is to protest against the Tamil Eelam Solidarity Organization (TESO) scheduled to be held in Chennai Sunday and also to the Eelam concept being promoted in the Indian state. The march is to start from the Colombo University premises at 10 a.m. on Sunday and proceed to the Indian High Commission on Galle Road in Colpetty where the protest is to be held. Police sources say that the security has been tightened in the vicinity of the Indian High Commission in Colombo. 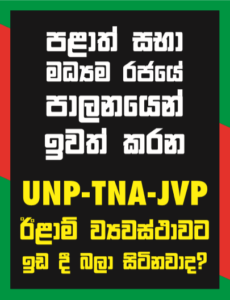 Collective of Nationalist Organizations comprises a number of Sinhala and Buddhist civil society organizations. Meanwhile the TESO conference remains in uncertainty after the Tamil Nadu police refused permission to hold the conference at the proposed venue citing security reasons and the Madras High Court judge today declined to hear an appeal by TESO lawyers challenging the ban.